Let Jamestown Awning custom design the perfect window, door or patio awning for your home. Add to your living space and enjoy your patio or deck to the fullest. Also lower energy costs by keeping your home cooler in the summer. According to the U.S Department of Energy awnings reduce solar heat gain by 65%-77%. Your new awning will also keep your furniture and carpet from fading from Mother Nature’s elements. 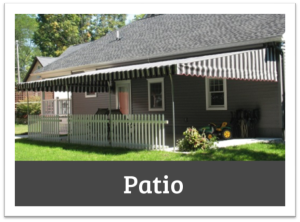 Awnings are available in a wide variety of patterns and colors. Patio: Patio awnings offer a great way to expand your outdoor living space. Add curtains to the sides for added privacy and protection. Available in a variety of colors and patterns to match any decor. 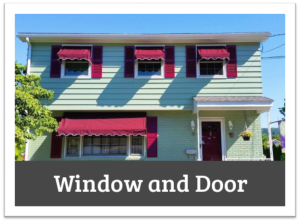 Window & Door: Window and Door awnings are a great way to add curb appeal to your home. Window and door awnings also help you save energy and money. Keep your home cooler this summer. Available in a wide variety of colors and patterns. 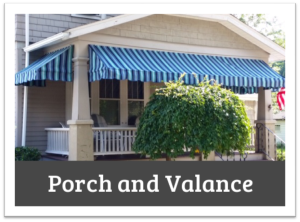 Porch & Valance: Porch awnings and valances are a great way to create privacy and add curb appeal. Enjoy your porch to the fullest by adding an awning and shielding yourself from the rain or sun. Roll Curtains & Screens: Jamestown Awning specializes in a large variety of custom porch enclosures, roll curtains, and screening products. Porch enclosures help protect you porch, as well as, give you privacy. Save energy and money by keeping your home cool in the summer and warm in the winter. Make your porch private and cool this summer or clear and warm this winter! 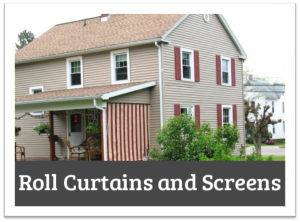 Roll curtains add shade and privacy to your home. Curtains can be used for both summer and winter to block the elements. Add a curtain to your existing patio awning for extra privacy or build a screen room to keep those nasty bugs out! 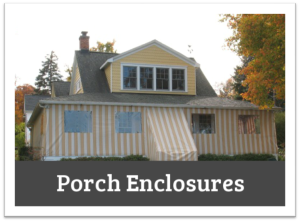 Porch Enclosures: Porch enclosures are a great way to protect your home from the winter elements. Available with both windows and doors to make entrance and exit easy. Porch enclosures not only protect your home, they also help to reduce your heating bills. No need to find a place for your outdoor furniture anymore, leave your items out all year round under your new porch enclosure. Retractable: Retractable awnings give you the flexibility of when you want sun or shade. Put the control in your hands with motorized options or let your mind be at ease with wind sensors. Offered in a wide variety of colors and patterns to fit your taste. 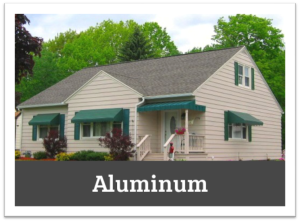 Aluminum: Adding aluminum awnings to your home is a great way to add shade and protect your home from the elements all year long. 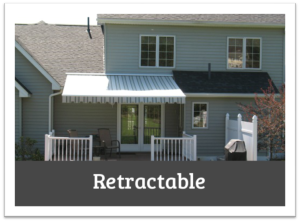 Once installed our residential aluminum awnings require no maintenance. Car ports are also a great way to keep your vehicle sheltered from rain and snow. Jamestown Awning and Party Tents offers Residential Awnings in Jamestown, Lakewood, Mayville, Westfield, Chautauqua, Bemus Point, Ripley, Findley Lake, Warren, Dunkirk, Fredonia, Bradford, Salamanca, Alleghany, Olean and many other areas throughout Western New York and Northern Pennsylvania. We have created thousands of awnings since 1964. There is no job too big or too small!